I can never express enough, how happy I am to be living on a tropical island! One of my best friends, who now lives in London, cannot help but feel desperate when I show her photos of our local fruits - the last one being longans! After coming up with a delicious but healthy tropical Pina Colada Smoothie using coconut milk, spinach and pineapple, I wanted to keep the fruity adventure going! And that is how I held onto the thought of making some Lemon Curd! 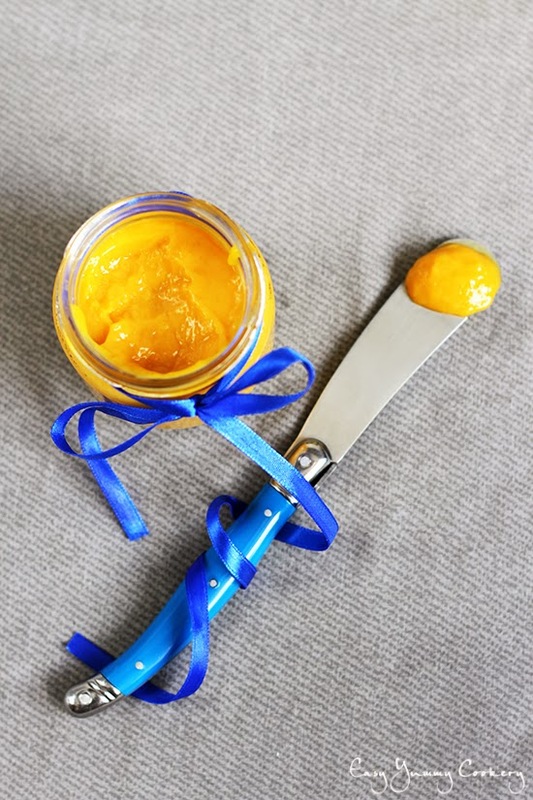 Easy Homemade Lemon Curd, incredibly Buttery, Smooth, Silky and Sweet but yet Tart! Makes a fantastic Topping, Filling, Base and Gift as well! 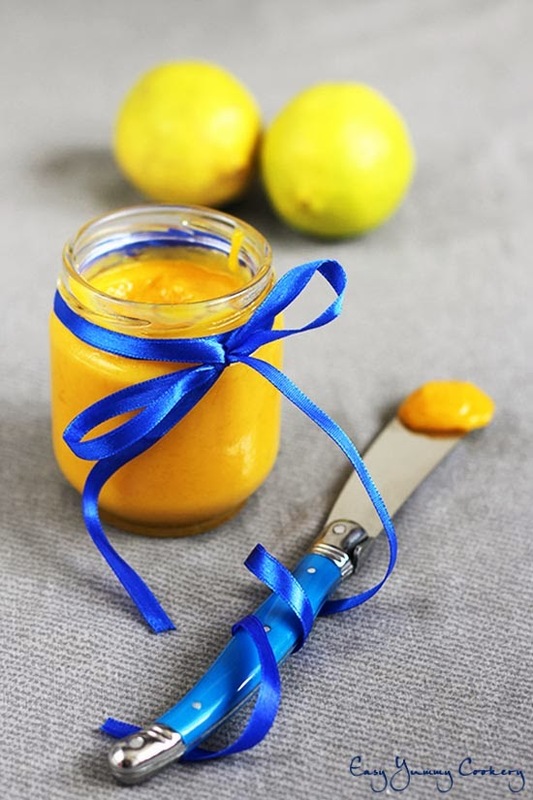 Now, for those of you who do not know it already, Lemon Curd is a spread like any other Fruit Curd made with fruit pulp or juice, butter, eggs and sugar! Yes, these are all you need! ...and bla bla bla..so many ideas! Place a stainless steel bowl on a pan of simmering water, set on medium-low heat and toss in, the lemon juice, sugar and lemon zests. Let cook until the sugar has completely dissolved. Turn heat off. Add a little of the hot lemon juice to the beaten egg yolks, making sure you whisk simultaneously. Add the egg yolk mixture to the hot lemon juice. Mix well using a whisk. Turn heat on, on medium-low and keep whisking/stirring the mixture until thickened (takes about 8-10 minutes). Turn heat off and add the cubes of butter to the mixture, still whisking until melted. Keep stirring until the mixture cools down to room temperature. Transfer to a jar or container, leaving upto 1/2 an inch space between surface of curd and lid. Seal to avoid skin from forming on the surface. Let refrigerate. The Lemon Curd will keep for atleast 2 weeks. There are many variations of Lemon Curd out there on the internet, if you prefer your Lemon Curd with Whole Eggs, go ahead and use 2 of them plus 2 Egg Yolks. Please, please do not attempt to make this Lemon Curd with bottled Lemon Juice. It's no good! You could strain the final mixture if you do not like the bits and feel of lemon zest in the month and to get a smoother curd. Do not worry over the curd not looking thickened enough when it is still hot, it will eventually thicken as it cools! Lemon Curd as with any other fruit curd will keep for 2 weeks. If you want to keep them for a longer period of time, process the jars in a boiling water bath. They will keep for upto 3 months, however if opened they will last for no more than 2 weeks. Lemon curd looks lovely and very well presented. Thanks for sharing this useful post dear. Going to try this for sure. Thank you Nandoos ;) Oh please do, and let me know how it turns out!